This fall, we decided to set up a shed to use as an outdoor cat shelter for the 3 cats that are in the backyard. At least two of the cats (Midnight and Charcoal) seem to stay in the yard most of the day. Pork Chop may only be coming for food. Before showing you the shed, I will discuss the storage bin shelters and the straw fort we used last winter. Note: Links in this post to Amazon are affiliate links and I may receive a commission at no extra cost to you if you click the link and then make a purchase. Last winter, we set up a small temporary fort made out of straw and two of the shelters made from storage containers. There are many videos on YouTube on how to use storage bins for cat shelters. I suggest you watch several to see which style you would like to make. My biggest recommendation for storage bin shelters is to buy a bin of high-quality plastic and a flat lid. The yellow lids on the storage bins in the picture cracked from the cold or maybe from water freezing and unfreezing. This year, we put a plastic bag around the lid so that the shelter could still be used. Below is the straw fort. It was made using our outdoor table, chairs, and straw. Then we covered it with a tarp. We used flower pots from a long ago forsaken attempt at gardening in the pots. 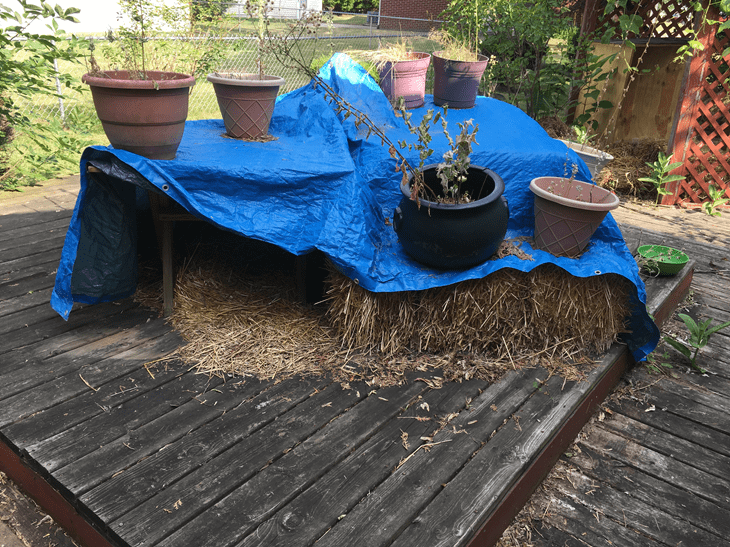 The straw fort worked well for one winter and was very cheap since we had all of the items already besides the straw. And the straw was only $4 a bale from our farmer. But by mid-summer, it was clear that the fort was only temporary as the tarp had started to break apart from the sun and weather. And then the straw was getting wet. And it wasn't safe to keep using for the cats as the straw in across the top was caving in. 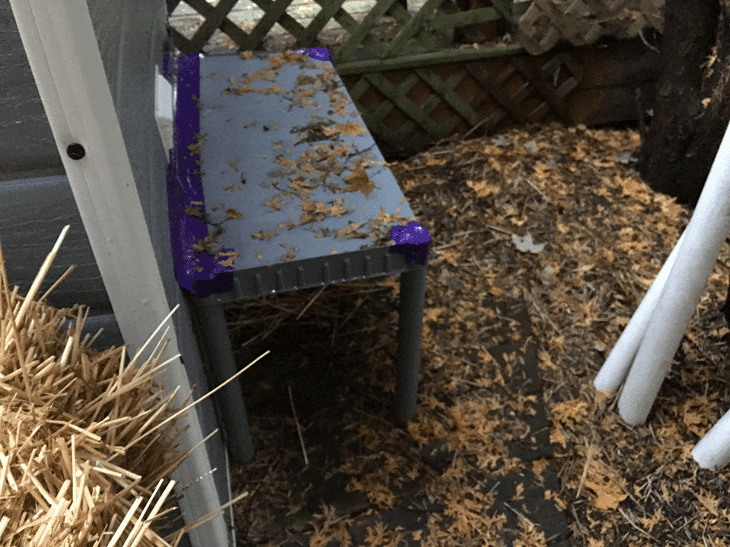 We used a straw fort for the first time in the winter of 2013 when we were feeding Other Buster, a neighborhood feral cat that we were feeding. His story can be read here (he disappeared in February 2014 but the food we were putting out for him attracted Violet to our yard). So, this year we decided to upgrade to a longer lasting and safer set up for the cats. Midnight is a big cat (he weighs more than 16 pounds) and we never saw him use the smaller shelters last winter. It's possible that he didn't fit through the opening! 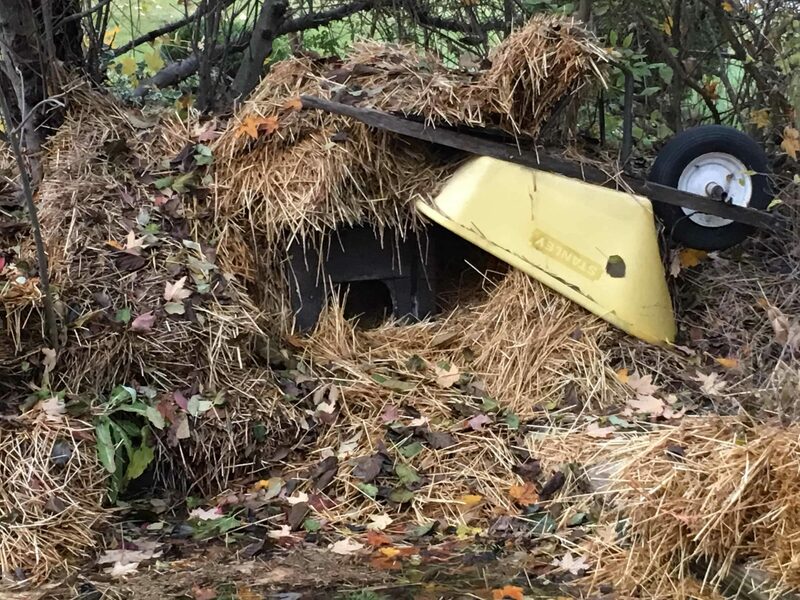 He did use the straw fort and sometime during the winter Charcoal showed up and begin to use it too. We ordered a small resin shed that we could place on our deck. And, my husband was able to assemble it by himself. He said it would have been easier with two people! We ordered it from Lowe's, but I noticed today that Amazon sells the same one. It has a window. I didn't want the cats to not have any light if they are spending long winter days inside the shed. This shed has two vents. You can see one in the picture below and there is another one on the back side. I don't want air to be too stuffy for the cats or for moisture to not be able to escape and cause mold. If someone were to look into our yard, that would not know that it was being used for cats (not everyone in my neighborhood likes having the feral cats around). We did several things to make the shed work as a shelter for the outdoor cats. First, two entrances were cut into the sides of the shelter. The size of the opening should be big enough for a cat, but not big enough for a large predator such as a large dog or coyote. Possums can pretty much fit anywhere a cat can so they may be using the shelters as well as smaller raccoons. After cutting the plastic, the edges seemed rough, so we used tape to make it smooth. 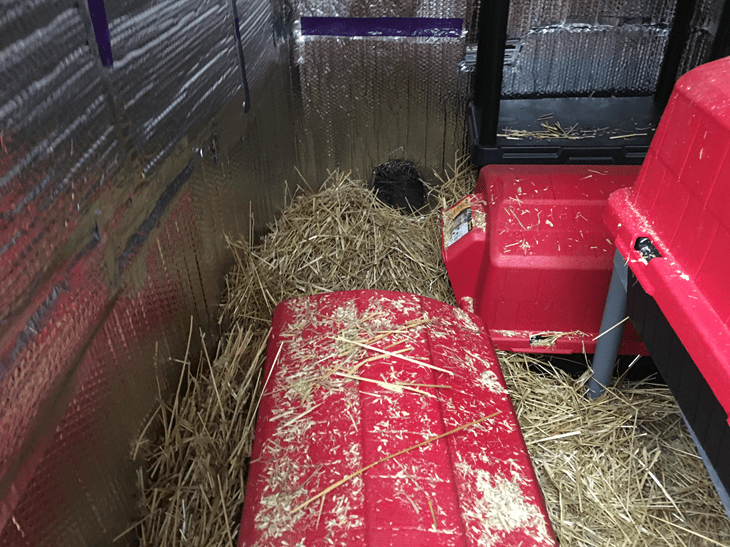 Second, the inside of the shed was lined with Reflectix insulation. The insulation will help keep the cats warm. What I like about Reflectix, is that it can be cut with regular scissors and then taped to the walls. Third, we put in some shelves. Since we have the 3 cats, we put in 3 dog houses lined with Reflectix (steps in the video below). One of the dog houses was placed on the shelf. Fourth, we taped shelves to the outside of the shed to cover the entrances to help keep rain and snow out. Final Step was putting straw in the dog houses and around them. I made a video with all of the steps to make the dog house a feral cat shelter. I choose to use a dog house, because the opening is big and then I also didn't have to do any cutting of the plastic. It just snapped together, and I was able to tape in the Reflectix easily. 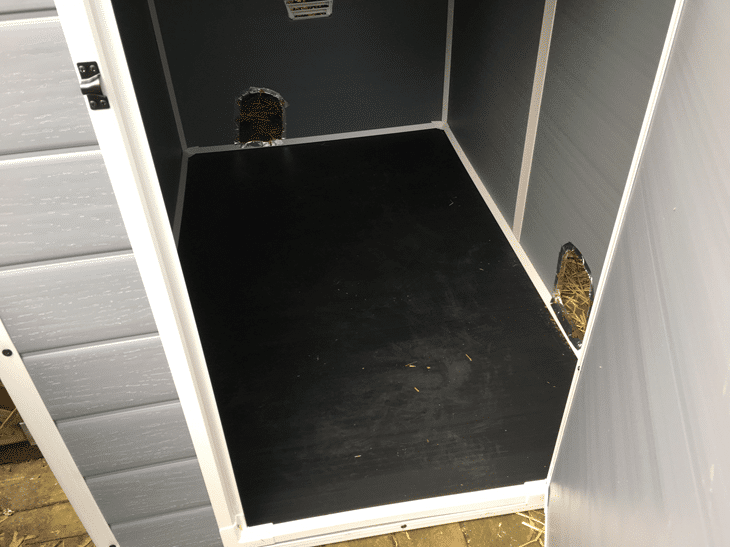 (Reflectix rolls come in different dimensions, you will obviously need much less for a dog house than a shed so be sure to order the size the meets your needs. In some of the comments on Amazon, people mentioned that they are using the dog house as shelter. I am assuming they aren't placing them into a shed. Given it's lightweight and the opening as on the larger side, you would want to secure it in some way and maybe come up with a way to prevent rain from going in. Below are photos of the completed shed project. I am also very happy to report that at least two of the cats are using the shed! 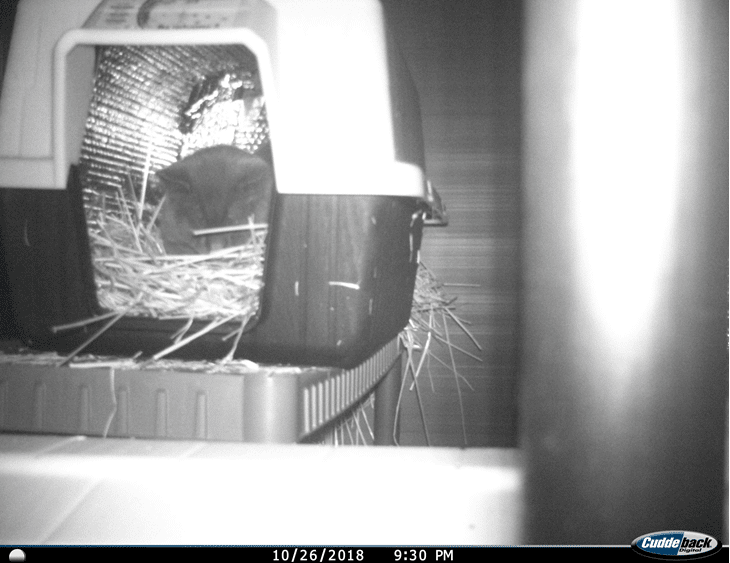 We had the trail camera placed inside for a few days and Charcoal is seen sleeping in one of the dog houses. Also, in all 3 of the dog houses, the straw has been matted down by the cats. Not all cats will want to go into a shed. Maybe they have sharing issues. You may want to provide alternative shelters. We haven't seen Pork Chop in the shed yet. But we have seen him using the cat house we made out of wood many years ago. It was built for Other Buster and you can see a snowy picture of him in the wooden house here. 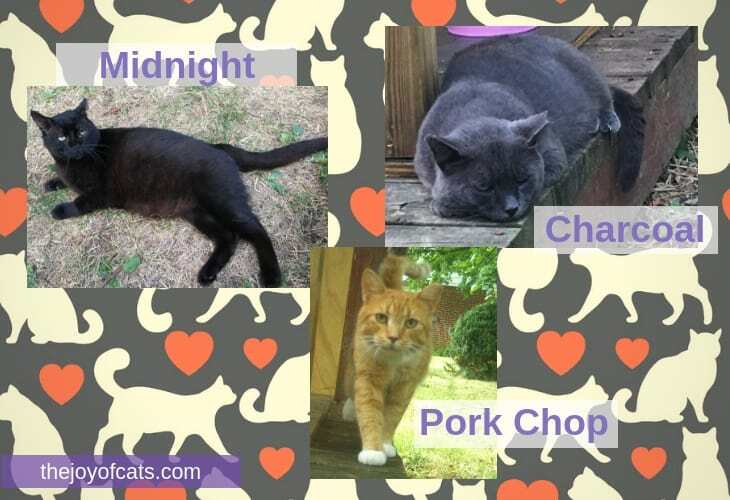 Alley Cat Allies has a long list of feral cat shelter options which you can read here. If you don't want anyone to know the shed is for cats, put the entrances on sides of the shed that are not visible to those passing by. If you are using an existing shed and leaving items in it, make sure the items are cat safe. Don't have anything sharp or toxic in the shed. I got the idea for a cat shed after seeing Kolony Kats setup a shed for some of the cats they care for. Their shed is much larger than mine. You can pick out a shed based on the number of cats you think will be using. If you decide on a wooden shed, be sure to shop around for the best price. We found a local place that has a contract with Amish families to make sheds, and the price was significantly less than the wood sheds at locals stores. I don't know if a wooden shed is better than a resin (plastic shed) since I don't have both. I suppose wooden might be more sturdy. And you could attach shelves to the walls. 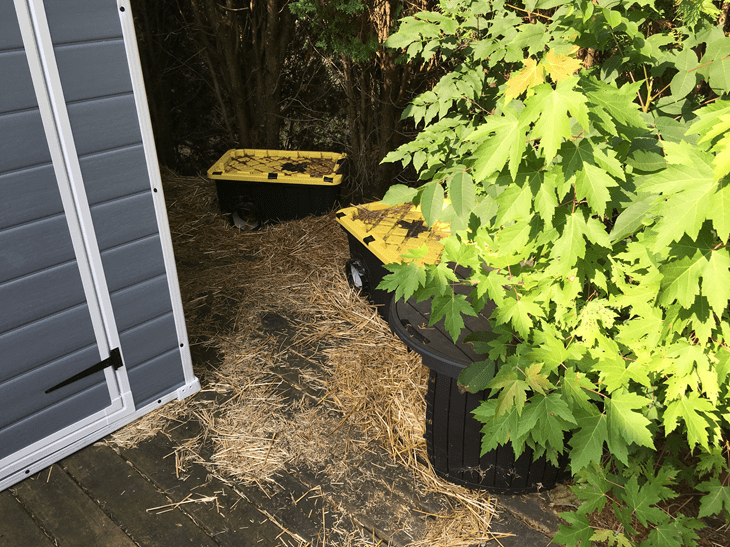 It's not recommended to put food and water inside of the shed as you don't want to attract predators to the shed. Local shelters/rescues or clinics that do low-cost spay/neuters for outdoor cats, may sell premade shelters in late fall or winter. 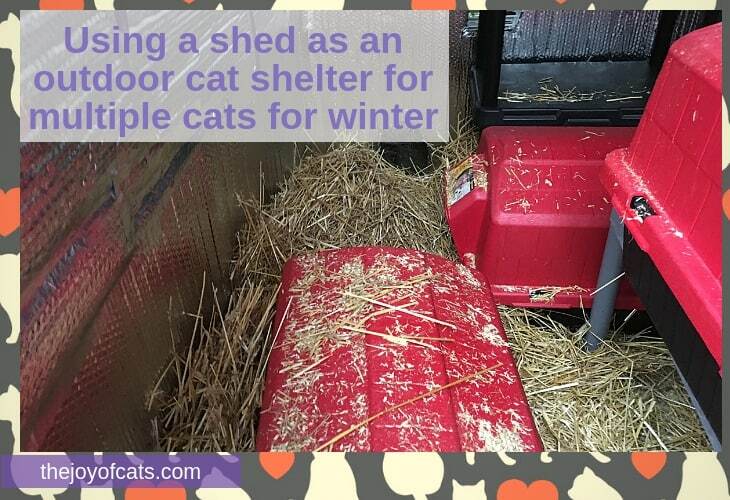 In summary, this post shows the steps we used to convert a shed into an outdoor cat shelter for winter. Are you using a shed for your feral/community cats?